Presently directed by the 4th generation of the Artero family, brothers Edu and Alex are now thrilled to be taking on the distribution of their latest and best selling products all over the United States. We are sure that all groomers and pet owners alike, will find something within the Artero product line that interests them. Whether it be shampoos, conditioners, grooming attire, professional grooming shears or our top selling hair-sprays, you will find it all here in! Perfect for thick or delicate coats. Gives shine and antistatic effect. Works soft and gently on all types of hair and skin. Easy to use on dogs or cats. Concave blade. High quality, durable nail trimmer. Ideal for medium to long coats, and medium to large breeds. Helps get rid of knots and matts very gently. Adapts ideally to the hand. Very light and easy to use. Very effective in finishes. Long durability. Very soft double sided flexible slicker small. The Black side is for d-matting and the grey side is for brushing. Very smooth and flexible. 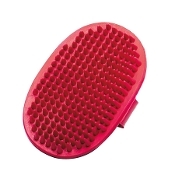 Can help in reducing wrist injuries caused by repetitive motion while brushing and d-matting. Size Aprox: 2" x 3"